Instagram has probably become the most popular photography app for mobile devices running iOS or Android. A lot of people have been interested in downloading and sharing Instagram photos, even if they are not Instagram users. The app has become so popular in the mobile platform that many people have been looking for alternatives for Instagram on computer (PC/Mac). We have previously covered several methods to access Instagram from your Desktop. But all these methods require you to log in to Instagram. 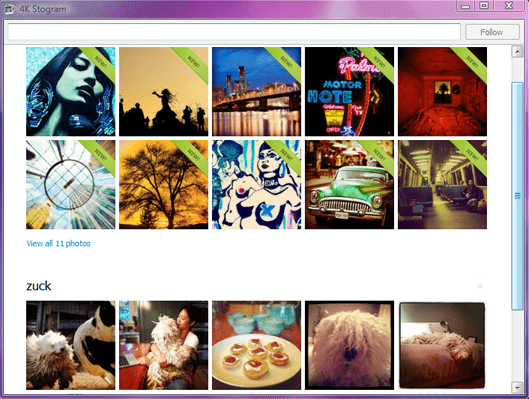 A new desktop application, 4K Stogram, offers a very simple solution to view and download Instagram photos. And the best part is, you don’t even require to have an Instagram account. 4K Stogram is a lightweight application available for Windows, Mac and Linux platforms. Downloading and installing takes just seconds if you have a decent internet connection. During the installation, the program creates a folder in your default Pictures location, where it automatically downloads Instagram photos. The application has a clean one-screen user interface, with no preferences or settings to configure. There is a search bar on top along with a Follow button. To download Instagram photos, just type an Instagram username in the search box and click follow. The program automatically starts displaying thumbnails of all Instagram photos shared by the user, and other relevant photos. Click on the thumbnails and if the photos have been downloaded, your default image viewer will open them. Once you follow a particular user, it stays there till you have manually decided to remove it. What’s more, new images uploaded by the particular user get automatically displayed and downloaded in the 4K Stogram folder. So you can literally “follow” the users and keep track of their Instagram photos. 4K Stogram has a minimal user interface whose only purpose is to save and backup photos shared by millions of Instagram users. It helps to download entire collections of Instagram photos. But that’s about all it does. If you are looking for a more interactive desktop client, try some other program which will suit you better (Instagrille from Pokki, Webstagram, etc.). Personally, we felt that the app could be improved on some grounds. One of the features we felt it should include is letting the user select which photos to download instead of downloading all the listed photos. Another feature it could add is a default list of some of the popular photos so that users can follow a default set of photos without having to enter a particular username.